Recently, my husband told me that he wanted to start eating more protein. So, of course, I came up with something that wasn’t boring and knew he wouldn’t mind eating. 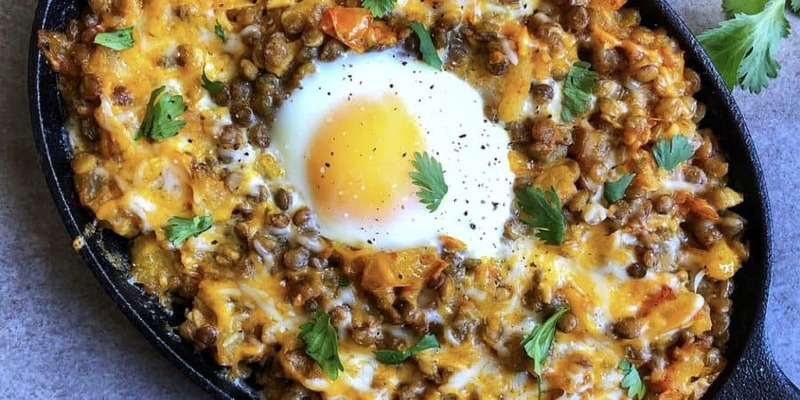 He always ordered skillets when we go out or brunch and that’s how the idea of this breakfast lentil skillet came about. After doing research, I noticed that lentils have a large amount of protein in them in comparison to other foods. It’s funny because I wouldn’t think lentils were good for anything but Lentil soup (3adas). I never really was a fan of them, to be honest. They actually worked really well in this skillet with eggs, cheese, and tomatoes. This meal is hearty, healthy, and a creative way to eat more protein in your diet! In a pan, add the olive oil and the garlic. Cook till garlic is fragrant; about 2 minutes. Add in the diced tomatoes. Allow to cook down till tomatoes lose its shape and become tender. Season with salt and pepper. This should take about 8-10 minutes. Then add the lentils to the tomatoes. Season with cumin, chili powder, salt, and pepper. Mix together. In a small cast iron skillet or oven safe pan, add the lentil mixture evenly. In the center, make a small hollow area for the egg. Crack an egg into the spot. Place in the oven for 10 minutes or so till egg is cooked to your liking. Take out and scatter the shredded cheese over the lentils. Put back in the oven for 2 minutes till cheese is melted. Take out and season egg with salt and pepper. Garnish with parsley.